– Each prize package is worth $55,500 and includes a $50,000 FBWC Ticket PLUS a five-night (Mar. 18th-23rd) VIP trip to Las Vegas and $1,000 cash for airfare. – $2,000,000 and the Fantasy Basketball World Championship Belt up for grabs. – $1,000,000 to first and only 50 total entries – each entry guaranteed to win at least $7,000. DraftKings clearly continues to up the ante with each passing year that they run live finals. Did we mention that this event is all going down in Vegas during March Madness? Because of that, DraftKings will also host huge viewing parties for everyone involved in the championship event. 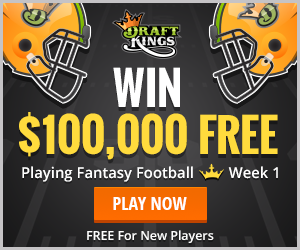 If you aren’t playing on DraftKings now is a great time to join up and enter a FWBC Qualifier for as little as 25 cents. – Each prize package is worth $13,5000 includes an $8,000 FHWC Ticket PLUS a five-night (Mar. 18th-23rd) VIP trip to Las Vegas and $1,000 cash for airfare. – $100,000 to first and only 25 total entries – each entry guaranteed to win at least $2,000. For those extra ambitious players, both of these championships take place in Vegas on the same weekend so you can qualify for both and enjoy an extra payday while you’re out there. Whether you’re shooting for one or both, with only 40 and 25 seats available in each of these, now’s the time to enter a qualifier and get your entry.